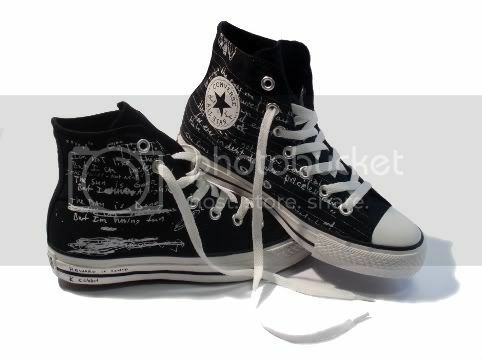 New this week: Converse shoes has inked a deal with Kurt Cobain widow Courtney Love to release"Kurt" footwear for the sneaker-maker's Fall 2008 Line. Just Days Later, Courtney Love was back in the press ranting that someone had stolen Cobain's ashes from a pink teddy bear purse she kept in a bedroom closet. I don't want to turn Kurt Cobain into an apostle, but let's get serious... Doesn't he deserve better?! 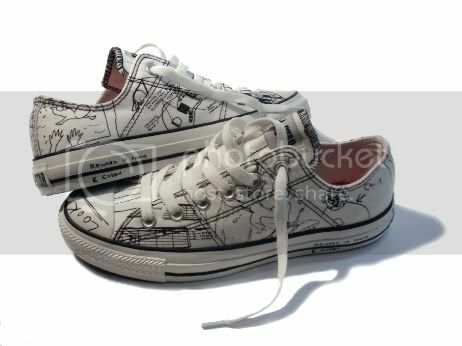 The sneakers would be one thing - but did Courtney have to allow images of his personal sketches and actual words from his diary to be emblazoned on the shoes? Literally and symbolically speaking, you are WALKING ON HIS WORDS. When you consider the context, the creativity, the angst and the emotion that was likely going on in those diary pages - isn't it sacrilegious to continually (and in the worst way, some might say) cash in on someone's artistry - their life's work? Now putting this aside - I can't fault Converse. If you make sneakers you have to look for endorsements these days for your line's survival. Landing a musical icon's name attached to your shoe line is probably a corporate dream come true. They are not that bad looking either - I like the white ones myself. 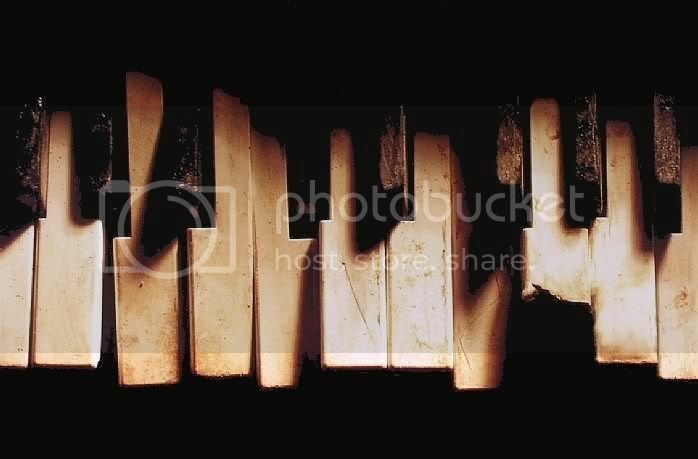 Wonder if there are song lyrics on them? (Did I mention....; They got Jerry Garcia too?! 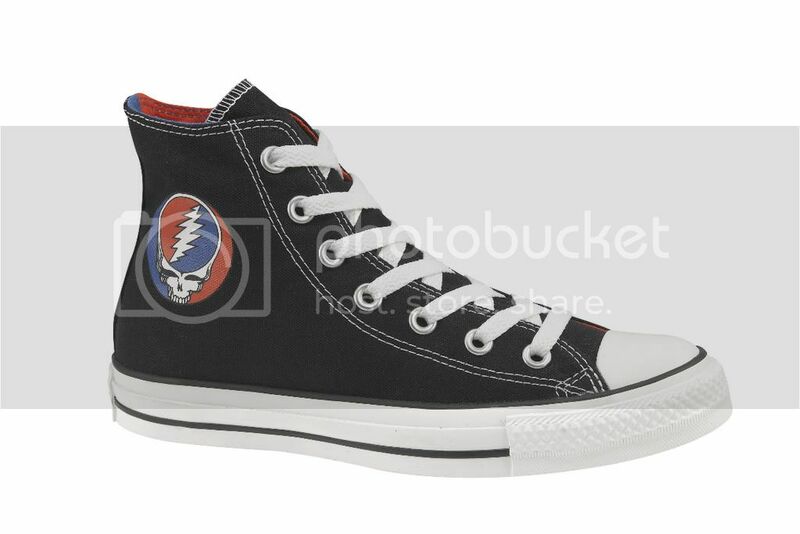 - Yes, Virginia, there will two (here & here) Grateful Dead Converses coming to a shoe store in a Mall near you. From the Press Release: Converse continues its celebration of 100 years with the debut of its Fall 2008 Footwear Collection that celebrates the brand's iconic presence throughout the last ten decades and undeniable influence on pop culture. 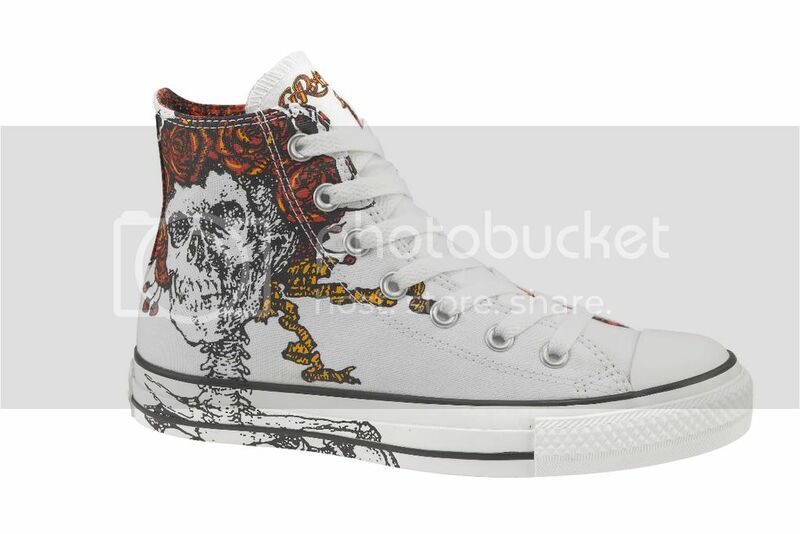 Converse pays homage to The Grateful Dead and Kurt Cobain as musicians who have transformed culture and changed the world featuring shoes designed to honor these pioneers of music who have disrupted the status quo. These latest shoes will be available at Journeys stores across the county. "As we continue into the second half of the Converse Century with our Fall 2008 Footwear Collection, we celebrate the originals who have never been afraid to disrupt the status quo. They are the renegades of sound, the league-changers, champions of underachievement, the paint drippers and those with flawless style...," said Scott Patt, Converse Global Footwear Creative Director. From Rolling Stone and Abroad: (Various Media Outlets are reporting this one.) As I mentioned at the top, there is truly bizarre news (more odd than the norm) coming out of Courtney Love's home. 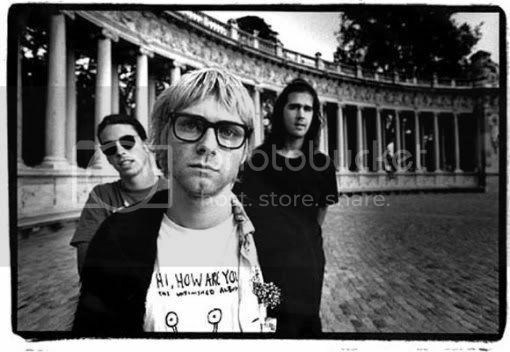 It seems someone stole their way into the home and stole what remains of Kurt Cobain's ashes which she kept (of all places) in a pink designer teddy bear purse hanging in her closet. Review of "Kurt Cobain: About A Son"
the grateful dead sneakers are cooler...sorry! They're not too bad. Are you a Steal Your Face or Live Dead man? It's true, you can't make it up. Good post. you can absolutely hold converse at fault just as much as courtney. it's the responsibility of corporations to assert and actively pursue ethical business practice.